Despite the bumps and bruises on takes after assuming office, President Trump is STILL more popular than his former rival Hillary Clinton. This isn’t the first post-presidential race poll illustrating Clinton’s sinking popularity. 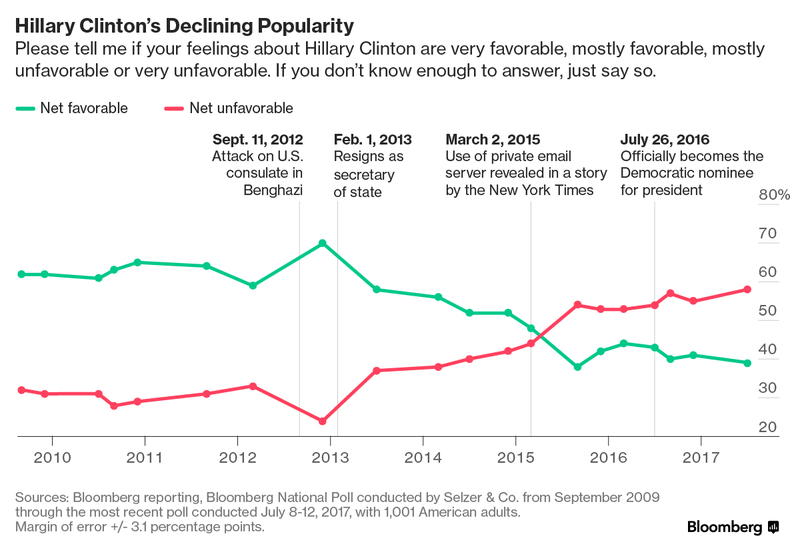 Back in March, the Washington Post released a brutal poll highlighting her ‘favorability’ at just 35% . But while Hillary seems to be fairly optimistic after her staggering 2016 loss, a new poll from Suffolk University reveals that her ‘favorability’ ratings among registered voters have dipped to all-time lows at only 35% . As the Washington Post points out, Hillary’s decline is due to both Democrats and independents apparently souring on her. While 88% of Democrats and 32% of independents liked Clinton in October, today those numbers are down to 74% and 25% , respectively. Clearly, even some who voted for Clinton — she won 89% of Democrats’ votes and 42% of independents’ — don’t have as much affection for her as they did at the tail end of the election. And lest you think this is just a fake poll with a Republican “oversample” designed to make Hillary look bad, the details actually show a 2-point sampling advantage for Democrats.